A resurgent return from the Edward Scissorhands maestro? Or another dud to add to his ever-growing pile? 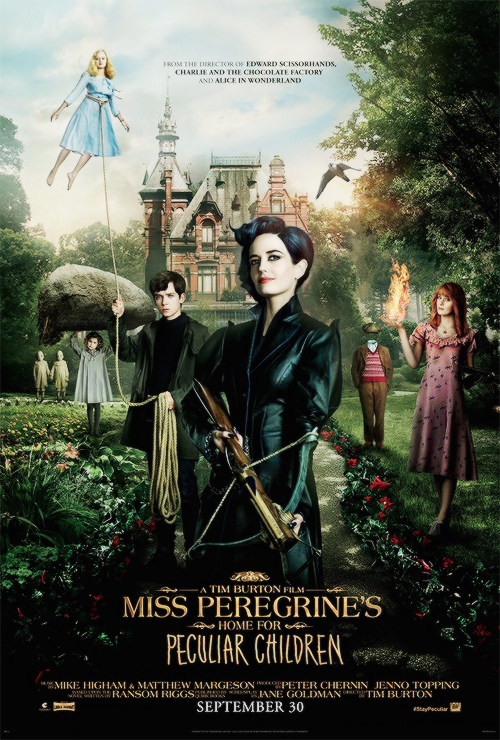 When Jacob (Asa Butterfield) discovers clues to a mystery that stretches across time, he finds Miss Peregrine’s (Eva Green) Home for Peculiar Children. 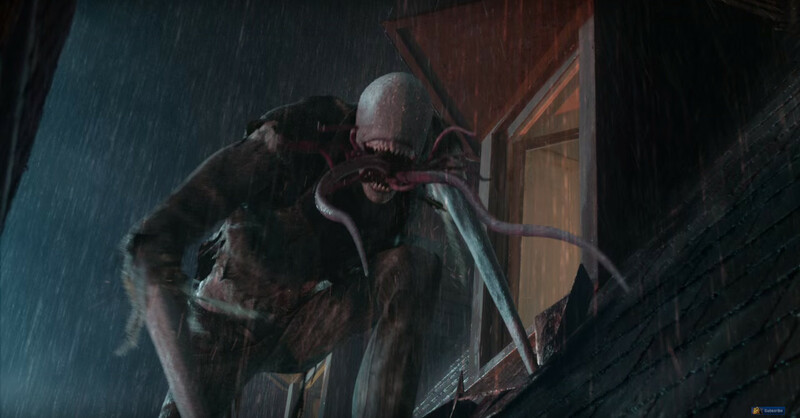 But the danger deepens after he gets to know the residents and learns about their special powers. Not bad. Macabre, mad, enthralling. Is Burton back? Well . . . almost. The creepy opening act certainly got things going as social outcast Jacob tended to his ailing grandfather (Terence Stamp). His home ransacked, his eyes missing (Burton really went for that 12A rating), his last words; clues to a mystery that Jacob thought was merely a fairy tale. I was a little disappointed at Stamp’s swift departure BUT thankfully a series of flashbacks added a much needed depth to their relationship as he told Jake stories of Miss Peregrine and her ‘peculiar’ children. Chris O’Dowd (The IT Crowd) played it surprisingly well as Jake’s downbeat dad. Not enough of him, to be honest. Reluctantly roped into Jake’s quest for answers. Delusions of a dementia-ridden man? Or something more? The slow build up as we delved into the grandfather’s past and the mystery of the boarding school was interesting enough. Especially when we got to meet the infamous gang. All the Burton trademarks were there. From Enoch’s macabre Nightmare Before Christmas demented puppet fights to Olive’s Penguin gloves (Watch out for a Hitchcockian cameo). Eva Green (Be still my beating heart. What?) was very good as Miss Peregrine. Delivering a crazy eccentricity to the role as she introduced Jake to the Peculiars and explained ‘The Loop’. A home hidden in a time bubble (Well, 1943 to be exact) that resets every day on a loop. Got it? Despite the mad special effects and talented cast, the loop stuff flagged up more questions and plot holes than I could muster. Don’t think about it too much or it really will spoil things. Especially in the closing act. I couldn’t fault any of the children as the Peculiars. They really were a mad bunch from the invisible Miller, the bee-spitting Hugh, the super-human Bronwyn and the gravity-defying Emma (Ella Purnell). They all had a chance to show off their strange abilities. I just wish more time was spent on that. Perhaps a little too much was wasted on the sulky Enoch (Finlay MacMillan) and his demented puppetry. Seriously, wait until he introduces Jake to Victor (*shudders*). Butterfield carried the film when the pace lagged. I was fidgeting by the 60 minute marker despite great chemistry between him and Purnell as Jake and Emma’s inevitable romance blossomed. However, that soon changed when Samuel L Jackson (finally) made his introduction (80 minutes?!) as the loathsome Mr Barron. He was brilliant. Even if he was battling with those crazy nashers. He lapped it up with enough fun and silliness even when his arms melded into some crazy T-1000 style weaponry. Of course, he wasn’t alone . . .
Yikes, these creepy Slenderman-esque Hollows will stick with me for a while. Feeding their sustenance with the eyes of Peculiars. The eyes?! I thought this was a kid’s film?! First, Coraline freaked me out with those button eyes and now this . . .
Miss Peregrine’s Home was entertaining and fun with enough crazy visuals that kept my griping at bay. BUT it felt like after all that build up and time spend on introducing the characters that it rushed to a silly conclusion with a chaotic showdown at Blackpool Tower. Unfortunately, I wasn’t familiar with the Ransom Riggs novels BUT with such a wide array of characters (and talented cast), it was always going to be difficult to give each character the right amount of screen time. Green was virtually absent by the final act and Dame Judi Dench’s role seemed like nothing more than an extended cameo. Shame. If there was to be a sequel, I would happily watch another. I just hope the stuff that was teased in the closing minutes actually develops into something or else this would have really been a waste. BUT don’t let that put you off a mad fantasy ride with enough charm and special effects to kill the time. Tim Burton goes back to basics with one of his most conventional films to date. With mixed results but it’s still worth a watch. Amy Adams and Christoph Waltz were superb. They had good chemistry and played the roles with aplomb. So what’s it about? 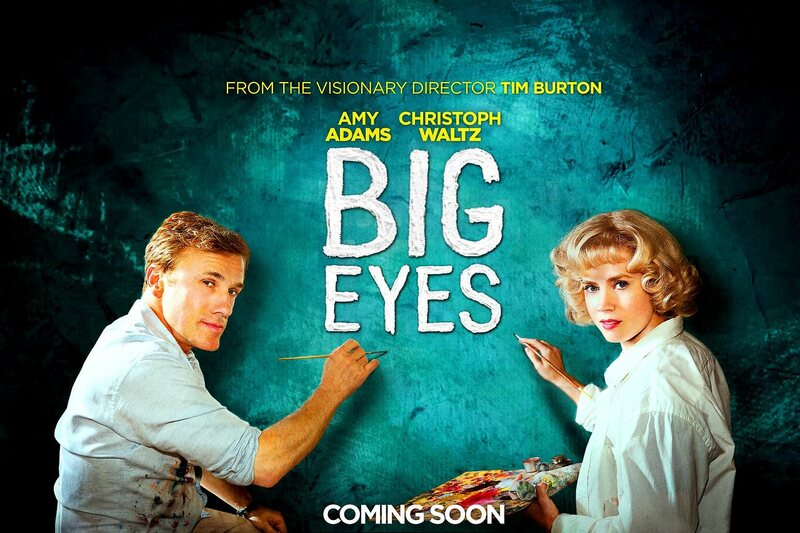 Big Eyes is a drama about the awakening of painter Margaret Keane (Amy Adams), her phenomenal success in the 1950s, and the subsequent legal difficulties she had with her husband (Christoph Waltz), who claimed credit for her works in the 1960s. The cinematography by Bruno Delbonnel delivered a sunny glossy feel and complimented the tone of the film perfectly. I was surprised that Burton had directed this. It’s so . . . normal. Beneath the surface of Burton’s wacky and macabre collections were conventional stories BUT it was always the fantastical elements that stood out for me. Edward Scissorhands being a perfect example. Granted. The last few efforts from Burton have been lacklustre to say the least. Alice in Wonderland was fun BUT missed the mark and Dark Shadows . . . Well. Don’t get me started. You know you’re onto a loser when not even the legendary Johnny Depp can save the day. This is a return of sorts with two cracking leads and an interesting biopic. I wasn’t familiar with Margaret Keane but I was with her work. The opening was easy going and zipped along as we follow Keane and her daughter as they try and start again. I think it helps to have a little context. Back in the 50s, a divorce was a taboo subject. And then to have a woman try and apply for a job that wasn’t a typist or secretary, well get out of town. We see Keane’s struggle as she tries to earn some income to keep a roof over her daughter’s head, while practicing her craft. Danny Huston’s (X Men Origins: Wolverine) journo voice over was a little irritating. Talented an actor he may be. I found his presence unnecessary by the closing minutes. Merely a reference point to confirm that certain scenes happened. All he did was spell things out that we already knew or were about to discover. A pointless character if I’m frank. Adams’ Southern drawl was a little disjointed to start with but she soon adjusts to the role and delivers another solid performance. Her supporting role was too small. She instantly made an impression and I was hoping for more of a clash between her and Waltz’s Walter. Her intuition sensing that something wasn’t right from the get go. Waltz and Adams worked well together and made a good pairing. It certainly made the predictable union a lot more bearable. It was interesting to see how a little white lie to sell one street painting became a decade long charade. Waltz played the snake charmer that was Walter brilliantly. The whole debate that a painting wouldn’t sell if the artist was female was crazy. And not completely unbelievable back in the 50s. BUT Margaret’s one moment of hesitance soon became a prison sentence. Reduced to painting in the loft or being locked away in a private studio adjoined to their expensive villa to hide their secret. There were a few twists that crept out of the woodwork. One I wanted explaining a little more. The sudden bombshell that Walter had another child from a former marriage wasn’t really covered. Merely pulled out to break up the lull that this film seemed to be heading in. Another twist was a little predictable but the discovery was still intriguing enough. Jason Schwartzman (Rushmore) was funny as the snobby art dealer who snubbed Keane’s works and continued to do so even when it was a hit! Again, not enough of him. A mere cameo. Waltz was able to balance the volatile behaviour of Walter very well. A smooth talker one second, an explosive drunkard the next. Terence Stamp played the cynical art cynic as well as he could but he was merely the catalyst to antagonize Walter and push Margaret to realise (at last) that her dream man wasn’t all he cracked up to be. The child actors that were hired to play Margaret’s daughters left a little to be desired. My mum may be hard of hearing BUT even I couldn’t decipher what Madeleine Arthur (The Tomorrow People) was mumbling about. Understandably this was Margaret’s story but they were very one dimensional. When Margaret decides to come clean, the drama does heat up BUT I felt certain moments went a little off kilter. Margaret’s sudden religious awakening didn’t really come off as well as I think it was supposed to. The appeal of living a life telling the truth certainly spurred her to take legal action but it came off a little hammy. If that is what happened then I can’t pick at it too much BUT it did feel a little disjointed. The court case in the final minutes was a little too comical. The tone seemed to go all over the place. I felt Waltz was allowed a little too much freedom and his one man prosecution act was incredibly OTT and didn’t fit with the film. And inevitably, the trial verdict soon relied on one vital piece of evidence with a predictable and flat outcome. The contents of this biopic and the tone was something I expected to see more in a TV movie. I also felt that Burton was restricted in applying his magic. The supermarket sequence in which Margaret sees everyone with BIG EYES was more along the lines of what I hoped. Similar to the vein of Big Fish. It’s not all bad. It’s well acted and highly watchable. A return of sorts for Burton. It gives me a little more hope for the (needless) live action remake of Dumbo.